Charlie Savage, the Pulitzer Prize winning New York Times journalist, has put together a wide-ranging and important examination of the Obama presidency focusing on the legal-security challenges of modern war. The huge account, perhaps Savage’s Magnus Opus, chronicles how “interpreting and applying national security law to such turbulent and rapidly changing conditions” post-9/11 was a huge amount of work for an Obama administration that sought to define itself against his predecessor’s record. 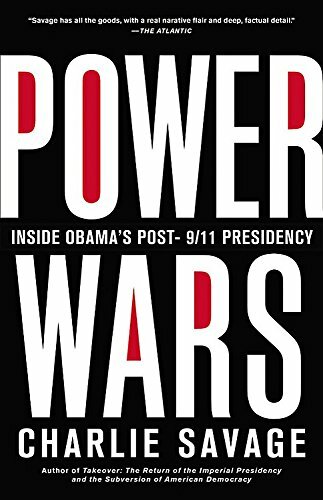 Power Wars tracks in some detail how difficult Obama found it to end some of the programs that Bush had initiated. Nowhere was this difficulty more obvious than in the case of the failure to close Guantanamo Bay. While the new president would describe the closure as “really important to me and to the country” and order it closed in 2009, over seven years later it remains open at huge cost to the American taxpayer, not to mention that it continues to hemorrhage U.S. reputation legitimacy (witness ISIS use of the iconic jumpsuits used by its hostages). One hundred seven prisoners are still being held at the camp at the time of writing, and Savage contrasts how the executive branch closed Bagram prison fairly easily but with involvement of Congress and the courts couldn’t close Guantanamo Bay. Facing the legal-security challenges saw Obama, who’d spent a decade teaching constitutional law, evolve into a extremely pragmatic “lawyerly” president. Yet Savage’s chronicle highlights the gap between rhetoric and action. The treatment and processing of “terrorist” suspects showed this challenge for a White House facing new problems and an extremely hostile Congress. The notion of moving suspects to civilian courts became a political hot potato and led Obama to adopt a military-civilian hybrid model. This was a costly choice, and in 2014 the US government spent $78 million, not including personnel costs, to achieve just 33 days of hearings in military commissions. Savage is well placed to take us on the journey of the Obama presidency, having good contacts on his “beat” although his continual reminder that sections were being reported “for the first time” eventually begins to grate somewhat. The interaction of politics and personality at the top levels of government reads as a bureaucratic soap opera around the scope and limits of executive power in a new type of war. Power Wars explores the challenges of bulk data collection and the prism scheme that by October 2011 saw the government was collecting “more than two hundred and fifty million Internet communications each year.” Snowden, Manning and Wikileaks all make an appearance as part of the story around the antagonism between secrecy versus transparency. James Denselow, a Director of the New Diplomacy Platform, writes about Middle East politics and security issues, has worked extensively in the region for NGOs and is a contributor to two books on these topics. His writing has been published in such venues as The Guardian and New Statesman.